Is a Tractor Mounted Snow Blower Right For Me? I bought a Craftsman 46 in 21 hp YT 3000 Model 28852 Yard Tractor, in part, because of your review. Now that winter is coming, I am preparing for throwing snow off the driveway. How well does this handle the blower in reality. I know they are compatible, but will it really handle it, and perform well? Will belts break, will there be enough power, or will the engine bog down? I would like to know before spending the $1400 on it, instead of $800 on a walk behind. Thanks, Matt. @Matt, The 21 hp has plenty of power. It doesn’t break belts very often unless the snow is really wet and heavy. I still recommend having an extra belt and shear pins on hand at all times. If you have a large, wide area to clean a tractor mounted snow thrower may be for you. They are a better option than a snow blade because you get the snow away from the sides of your drive. To turn around easily you should have a driveway two cars wide or larger. A tractor mounted snow thrower can move 4 to 10 inches of snow quickly. Some reasons you may not want a tractor mounted snow thrower. 1. You have a lot of sidewalks. The tractor mounted snow thrower is 42 inches wide, most sidewalks are 36 inches or less. 3. You don’t have a lot of room to store a tractor mounted unit. It’s over 8 ft long. It takes up as much room as a 4 by 8 sheet of plywood laying on the floor. 4. You get heavy wet snow. There are a lot of videos on YouTube showing the Craftsman blowing snow, but it does go through belts if the snow is very wet. 5. You need weights and chains. Chains scratch your cement drive and leave brown rust marks. 6. In my opinion if your driveway is smaller than 16 by 120 I always suggest a walk behind over a tractor mounted. On that size drive the only time I agree a tractor mounted may be for you is if you have a hard time walking. 7. If you clean a spot in the backyard for your dogs a tractor mounted will tear up your lawn. 8. You need a set of sockets and other hand tools to mount the snow thrower the first time. You need to be able to lay on the ground and work. It takes about 3 hours to install the mounts the first time and then 45 minutes after that to remove the deck and install the blower. You should be familiar enough with your equipment to change the belts if you break one. 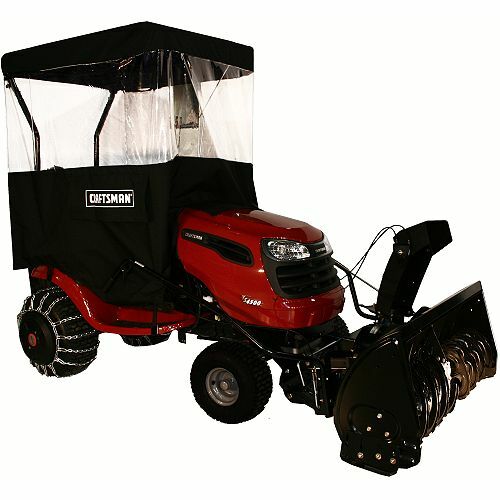 Other factors in determining the type of snow blower you need. -Steps, ramps, up and over berms, large areas of turf to clean. 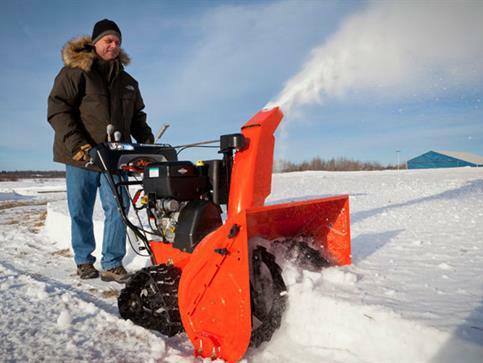 Ariens track drive with auto turn steering. Of course, please go to The Best Snow Blowers For 2013-2014 and I’ll help you find the best walk behind snow blower for you.